W hen I moved from the Norfolk/Virginia Beach, VA area to Lafayette, Indiana 2 1/2 years ago, a lot of people told me that Lafayette didn’t have much in the way of really good restaurants. Please feel free to add your comments at the bottom of the page. If you wish to speak to a specific restaurant, be sure to name it in your comment. 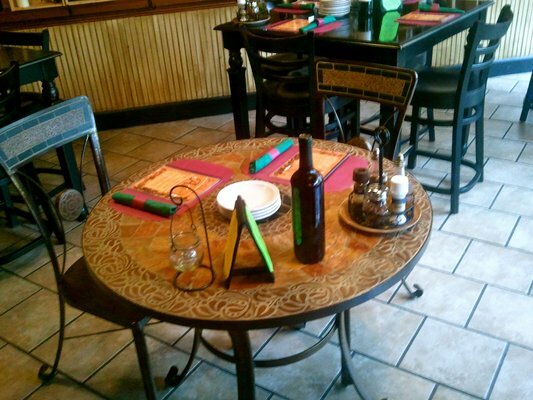 If you know of a great restaurant that we haven’t mentioned yet, please comment on that as well! Thanks! Yesterday we made a reservation and head out with high hopes. Here’s what happened when we arrived. They had our reservation and immediately led us to our table. They didn’t ask if we minded being upstairs (my husband has had 3 back surgeries, 1 neck surgery, and recently had a total knee replacement), just had to hurry to follow behind the young lady who led us past many empty tables, up the stairs, past more empty tables, to a tiny table in the far back in a corner – against a wall and my chair tucked into the corner – can we get farther back than that? Ok..
We started looking over the menu. It’s fairly extensive. We read it all, then read it again – no offer of water, no one took a drink order, no one came to our table in the back at all. A group sitting near us had a waiter who went over the menu with them, asked if they were on a special diet, made suggestions (had already brought them water and taken their drink order and put it in). Left and came back with their drinks. Then another couple were sat beside our table and the waitress was there at the time they were seated, asked if they’d like water and took their drink order. We had now been sitting for 15 minutes and no one had ventured near us. We looked at each other and said, well, I think it’s time to go. We left, walked down to Spurlocks where I got a Farmers burger (burger with a fried egg and bacon on top – hold the bun. It was delicious and fit my diet perfectly! Pork Belly Sliders:- oo pork belly! but wait, it’s caramelized with acorn-and comes with whole WHEAT buns, creamy MAPLE slaw, Bubbie’s bread and butter pickle – can someone say SUGAR? charcuterie, honey or jam, fresh bread, pickled vegetables, and/or fruit. Served with bread. Next category is Salad – Can’t go wrong with salad, right? Entrees all served with potatoes or rice or risotto… I won’t go on, you get the picture. We found Adelino’s recently, although we wish we found it much earlier! Yes – it’s that good. Chef Rosa is the owner and the restaurant has been created to celebrate his grandfather, Adelino, as well as Chef Rosa’s Portuguese heritage. I won’t tell you the story of Adelino, let the Chef or his staff impart that information to you – it’s a treat! The restaurant features a full bar, a dining area, an upstairs ballroom and banquet area, and, in the back, there is the infamous Chef’s Table – a beautiful long marble-inlaid table that seats many, many people for Chef Rosa’s special events. There is a regular menu with soups, salads, vegetables, entrees, Pizzas, kid’s menu, and desserts but there is also a Tapas menu and a Family Style menu. So you have many choices in what and how to eat. They cater as well! The chef even has classes for kids aged 7 to 12 (they must be accompanied by an adult). For more information about these classes click HERE. He also hosts special events. We recently attended his Portugal Wine Dinner. Can you imagine a dinner that is served BY the chef? Chef Rosa served each course – and each course came with a different wine, which he also poured for us. As we ate, he imparted the story of Adelino. It’s a heart-warming story about a man who truly understood the meaning of Love Thy Neighbor. Each table had bread waiting. The first course was a really tasty fish soup with a clear broth that was filled with chunks of white fish, potatoes, onion, bacon and parsley – it was amazing with the bread dipped into it – think that’s a no-no? It was encouraged by the chef! The next course a simple (simply delicious!) plate of beef tenderloin in a creamy sauce with mushrooms and was accompanied by a bowl containing a medley of potatoes with spanish chorizo, sweet peppers, onion, garlic and wine sauce (a red wine with sugar and cinnamon that has been reduced for hours over low heat) Spanish chorizo is quite different from Mexican. I looked it up and here’s what I found: While Mexican chorizo is seasoned with chili peppers and vinegar, Spanish chorizo is made basically with pork (as far as I know with lean pork loin), sweet paprika and garlic, and is cured either to a hard sausage consistency, to be sliced and eaten as an appetizer, or to a softer consistency to use in cooking. – from the website of Penelope Casas where she answers many questions about Spanish Cuisine. The beef in this dish could be cut with your fork and, again, the sauce was mouthwatering when scooped up with the bread. The potatoes with the wine reduction had a unique, and quite delicious, flavor. I really enjoyed it. The third course, chicken with rice and spanish chorizo, didn’t have as much sauce and it was a bit heavier but still delicious. A very hearty dish, food.com calls it an alternative to paella. Fourth came the rabbit with a much thicker rice (Arroz de coelho), this dish is the traditional dish that Adelino served his guests when they came to dinner at his home – along with the wine he made in his bathtub! – he loved to host dinners for his friends. Last came Chef Rosa’s grandmother’s traditional dessert. A very simple but satisfying rice pudding. Its charm is its simplicity. While just a combination of rice, cinnamon and cream – it had us scraping the bottom and wishing there was more. The truly amazing topper to the evening was a glass of Chef Rosa’s own personal 120 year old port wine. He had obtained 4 bottles of this delightful nectar from Portugal and one sip quickly impressed with its quality and set it apart from all the other wines. The chef suggested closing your eyes, taking a sip and just holding it on your tongue for a minute. Ahh, it was heavenly! In my opinion, Adelino’s has everything a good restaurant should have, great food, great staff, and best of all, when you come in you’re greeted like a friend and get that wonderful “everybody knows my name” feeling that a really special place gives. Have you attended one of Chef Rosa’s Cooking classes or Special Events? 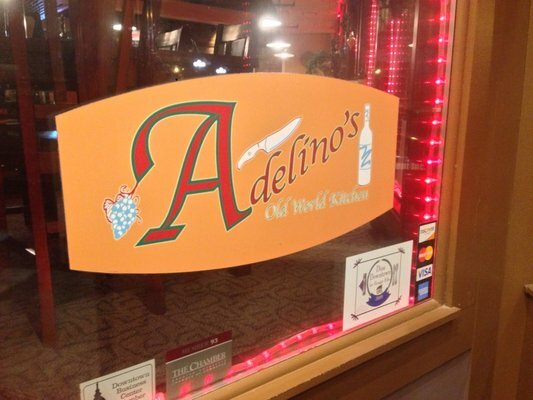 Have you dined at Adelino’s? Please tell us about it in the comments below! I’d love to hear about it! Addendum: We visited Adelino’s again in April. They changed their menu so of course we had to go and see what was new! Steve had the boar chops with garlic smashed potatoes and Susan had the Jumbo Shrimp wrapped with bacon also with garlic smash. Both entrees were spectacular. The boar, which we’d never had before, was perfectly cooked, and very flavorful. We got it with the Hunter’s sauce. mmmm We’d get it again anytime! The shrimp were grilled on a skewer and were also cooked perfectly they were huge and delicious. We also had, as a starter, the GOAT CHEESE CROSTINI tapas plate – Creamy goat cheese spread with figs, grapes, honey and walnuts over grilled garlic toast. It was so flavorful and delicious. Next time we go, we think we’ll get all tapas plates. Everything looked so good. Steve had his favorite Warsteiner Dunkle and Susan had the Portuguese Cream, which was described as a chocolate shake on steroids – bartender Shane’s own invention. Everything was wonderful, as always. Our server, Frederick, was great, the ambiance was warm and inviting and we thoroughly enjoyed ourselves! Last night, before attending one of Purdue’s Convos, Streb Forces,(which was amazing, btw) we decided to go out to eat at RedSeven. My review on this is a bit mixed. When we arrived, the first thing we noticed was the noise. It sound like there was one BIG party going on in there! Although we had reservations and we arrived 5 minutes early, we were shown to a table all the way in the very back. They had to pull two tables apart for us – so it didn’t really feel like they were expecting us or had set a table aside for us. Then the fellow who had showed us to the table came back and said another party was coming to sit at the table next to ours and wanted to shove our table over further so we’d have more room… Ok.
At this point, I was feeling a bit beyond annoyed, but accepted our menus and began to peruse the choices. The waitress came and got our drink order – I had a diet coke and Steve had a beer. I decided that I’d like an appetizer as my entree – the Beef Lettuce Cups: stir fried asian beef and vegetables served with romaine lettuce leaves. Steve asked if they had soups (none were listed on the menu) and the waitress said they did! Clam Chowder and a Chicken Noodle. Steve asked what kind of chowder it was and she didn’t know there was more than one. He asked if it was white or red. White – ok, New England Clam Chowder. I chose to have a bowl of that as well. Steve ordered the Boursin Crusted Flank Steak: whiskey marinated flank steak, boursin cheese, citrus spinach and herb roasted potato duet. We chatted above the cacophany while we waited. I must say that the noise level fluctuated quite a bit with some quieter times here and there. Our dinner began to arrive in a timely manner. Steve’s salad and my soup were served together first. The soup was very good. Not too thick, which I was thankful for and seasoned very well. Steve enjoyed his salad as well. Then came the rest. My Lettuce Cups were beautifully arranged with a bowl of the beef stirfry in a bowl alongside the large crisp romaine leaves. The filling was very, very sweet but were very tasty. I’d have chosen for them not to be quite so sweet, but I did enjoy them. Steve’s steak was delicious. It was marinated in whiskey which gave it a slightly sweet taste and the boursin cheese was a great counterpoint to that. It had two types of potato – garlic whipped potatoes on one side and herb-roasted potatoes on the other. It was topped with fried onion rings – the thin kind. The citrus spinach was hidden underneath the cheese but complemented the meal quite well. When we received our bill, we noticed we were charged for an extra soft drink, which the removed. Overall, if you don’t mind the noise, the food was pretty good. We didn’t really feel like our reservations were meaningful and that was a little off-putting. They have a fairly large menu with Starters, Pastas, Steaks and Chops, and Pizzas as well as desserts, coffees, and a wine and beer menu. 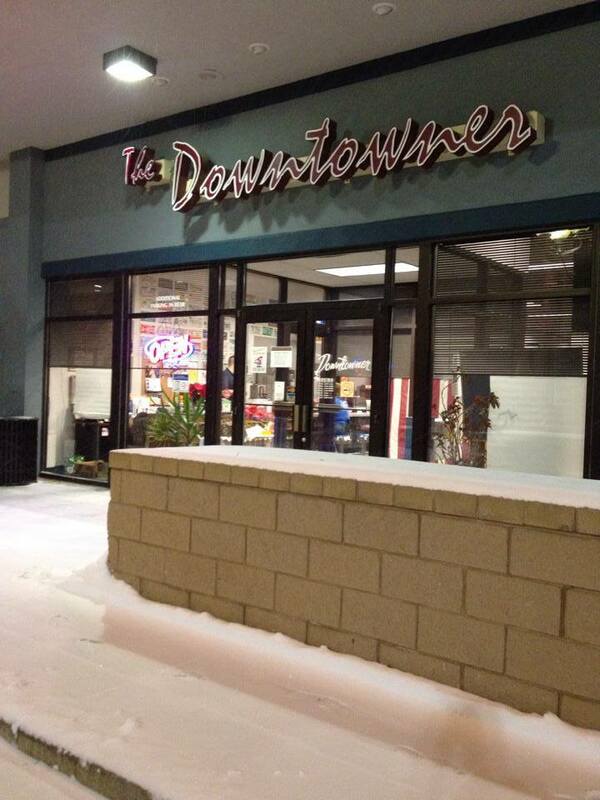 Don’t miss the Downtowner for breakfast. It’s a Lafayette staple!! And it will be hard not to find someone you know there! It’s ALWAYS packed!! I’d recommend trying the blueberry pancakes. I don’t know what they do to their pancakes, but they’re the lightest, fluffiest pancakes I’ve ever tasted! And if you order the blueberry pancakes, there are blueberries in every bite. And I don’t mean little dried up berries. These are huge juicy blueberrys. AND they bring a metal pitcher of heated syrup along with some butter out with them! WOW. Their other breakfasts are also delicious. Click here to see menus. They apparently don’t have a website of their own, so I got some info from UrbanSpoon – click here for directions to the Downtowner and other info. Their food is amazing and the service is top notch. This is not a chain!! And it shows. 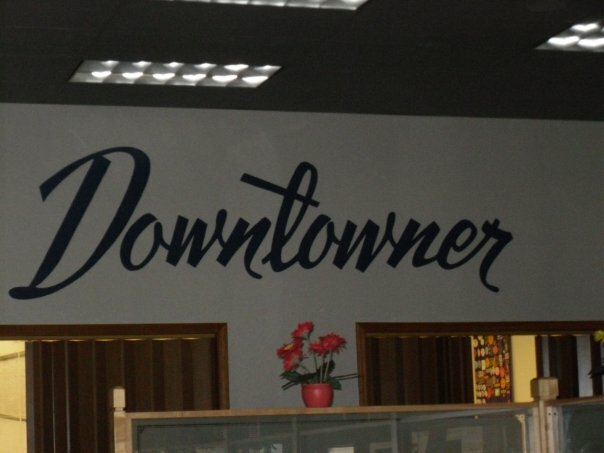 🙂 If you live in Lafayette or if you’re just passing through, you don’t want to miss the Downtowner! Thank you Susan….very impressed! Sounds like a fun, but costly dinner! Enjoyed your in depth with detail descriptions….YOU ARE GOOD!!! Never went there….YET?? The special event dinners can be a little more costly – the Portugal Dinner Event was $45.00 a person and was VERY worth it 🙂 And their cooking classes are a BLAST! – $35.00 a person and it includes two different wines and everyone eats all the items cooked by all the “students” then discusses them and the chef gives suggestions on what could have made them better. check out their webpage (link is on their name) for their menu. The prices aren’t too bad – $$ – not $$$$, hehe. A nice special dinner. But it depends on what you order of course. And they have tapas – little plates of different items, which is fun. I’m glad you enjoyed the descriptions. Know of any local restaurants you’d recommend trying?